For the former Cincinnati Reds player and front office man, see Sheldon "Chief" Bender. Bender was born in Crow Wing County, Minnesota as a member of the Ojibwe tribe. His father was German and his mother was part Chippewa. As a child, he received the Indian name "Mandowescence", meaning "Little Spirit Animal." His family had 160 acres on the White Earth Indian Reservation near Bemidji, Minnesota. His father taught him to farm on the reservation. He graduated from Carlisle Indian Industrial School and attended Dickinson College. 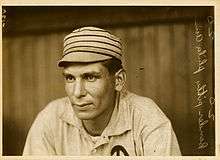 Bender was nicknamed "Chief", a common nickname for baseball players of Native American descent. Biographer Tom Swift writes that Bender "was often portrayed as a caricature and was the subject of myriad cartoons – many exhibits of narrow-mindedness. 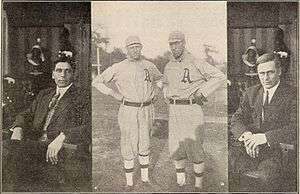 After he threw one of the most dominating games of the early years of the American League, Bender was depicted wielding a tomahawk and wearing a headdress as though he was a happy warrior." ↑ There is uncertainty about Bender's birthdate. He was voted the SABR "Centennial Celebrity" of 1983, as the best baseball player or figure born in 1883. However, the SABR Baseball Research Journal for 1983 acknowledges that there are discrepancies in records about Bender's birth year, ranging from 1883 to 1885. 1884 is the figure most often given. 1 2 "Chief Bender Minor League Statistics & History". Baseball-Reference.com. Retrieved July 6, 2014. ↑ 2014 Baseball Media Guide (PDF). United States Naval Academy. p. 51. ↑ 2014 Baseball Media Guide (PDF). United States Naval Academy. p. 46. ↑ Kaufman, King. "Chief Bender's Burden (review)". Salon.com. Retrieved November 1, 2014. ↑ "Big Chief Bender trap-shooting star". The Day (New London). March 2, 1915. Retrieved November 1, 2014. ↑ "Chief Bender is going into business". Dawson Daily News. June 1, 1914. Retrieved November 1, 2014. ↑ Gorman, Robert, Weeks, David (2009). Death at the Ballpark: A Comprehensive Study of Game-related Fatalities of Players, Other Personnel and Spectators in Amateur and Professional Baseball, 1862–2007. McFarland. p. 102. ISBN 0786452544. Retrieved July 5, 2014. ↑ Ritter, Lawrence (1966). The Glory of Their Times. p. 199. ↑ "National Baseball Hall of Fame and Museum: Hall of Famer detail" Archived May 25, 2009, at the Wayback Machine.,National Baseball Hall of Fame. Accessed July 8, 2007. Kashatus, William C. (2006). Money Pitcher: Chief Bender and the Tragedy of Indian Assimilation. Penn State Press. ISBN 978-0-271-02862-0. Powers-Beck, Jeffrey P. (2004). The American Indian integration of baseball. University of Nebraska Press. p. 269. ISBN 978-0-8032-3745-2. Wikimedia Commons has media related to Charles Albert Bender.